Stephen Bunting started to play darts when he was 12 years old and in 2001 won the British Teenage Open and 2002 the World Youth Masters and the WDF Europe Cup Youth, From then on he plays the BDO Circuit. 2004 he qualified with 18 for the first time for the BDO World Championship but lost second round against Ted Hankey. He qualified again in 2005 and 2009 and lost both times in first round. In 2011 he again took part and this time reached the quarterfinals of the tournament. The same result he reached some months later in the Winmau World Masters. 2012 he couldn't qualify for the World Championship but won the Winmau World Masters - his biggest success so far. He returned to Lakeside in 2013 as the number 1 seeded player but lost to Darryl Fitton in second round - the biggest upset of the tournament. 2014 he again entered the tournament as the number 1 seed and this time he won the title. On 22. 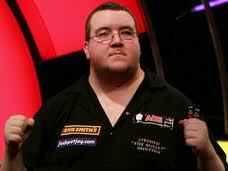 January 2014 Bunting announced he'll switch to the PDC. Bunting already was several times nominated for the English national team.